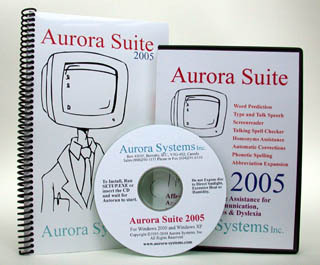 Aurora Systems, Inc. - Affordable, Effective Solutions for People with Special Needs. There are a few simple reasons why we think people should choose Aurora. Aurora Word Prediction works really, really well. Compare it against the competition, we have. Aurora has the comprehensive feature set the experts (PhD's, therapists, parents, and most importantly, Aurora users) tell us they need. Every user is unique. We make sure Aurora is simple to use, yet flexible so that it can adapt to your requirements. You don't need more problems. We take great pride in making really well made products. Copyright (C) 2010 Aurora Systems, Inc. All Rights Reserved.